The scientists have successfully used the new plastic to make lithium-sulfur batteries. 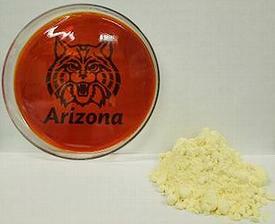 Next-generation lithium-sulfur, or Li-S, batteries will be better for electric and hybrid cars because they are more efficient, lighter and cheaper than those currently used, said lead researcher Jeffrey Pyun, an associate professor of chemistry and biochemistry at the University of Arizona. “We’ve developed a new, simple and useful chemical process to convert sulfur into a useful plastic,” said Pyun. The new plastic performs better in batteries than elemental sulfur, Pyun said, because batteries with cathodes made of elemental sulfur can be used and recharged just a limited number of times before they fail. The new plastic has promise as something that can be produced easily and inexpensively on an industrial scale, he said. The team’s discovery is a new use for the mountains of waste sulfur left over when oil and natural gas are refined into cleaner-burning fuels. Although there are some industrial uses for sulfur, the amount generated from refining fossil fuels far outstrips the current need for the element. 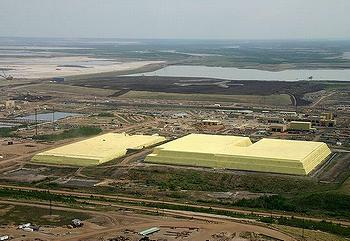 Some oil refineries, such as the oil sands refineries in Ft. McMurray, Alberta, are accumulating yellow mountains of waste sulfur. About one-half pound of sulfur is left over for every 19 gallons of gasoline produced from fossil fuels, calculates co-author Jared Griebel, a University of Arizona chemistry and biochemistry doctoral candidate. Pyun says he undertook this research because he wanted to apply his expertise as a chemist to energy production. He knew about the world’s glut of elemental sulfur at oil and gas refineries – so he focused on how chemistry could use the cheap sulfur to satisfy the need for good Li-S batteries. He and his colleagues tried something new – transforming liquid sulfur into a useful plastic that could be produced on an industrial scale. sulfur poses technical challenges. It does not easily form the stable long chains of molecules, known as polymers, needed make a moldable plastic, and most materials don’t dissolve in sulfur. Pyun and his colleagues identified the chemicals most likely to polymerize sulfur and began to test those 20 chemicals one by one by one. They got lucky. “The first one worked – and nothing else thereafter,” said Pyun. The new plastic has electrochemical properties superior to those of the elemental sulfur now used in lithium-sulfur batteries, the researchers report. The team’s batteries exhibited high specific capacity and enhanced capacity retention, Pyun explained. The researchers have filed an international patent for their new chemical process and for the new polymeric electrode materials for lithium-sulfur batteries. The international team’s research article, “The Use of Elemental Sulfur as an Alternative Feedstock for Polymeric Materials,” was published online in the journal “Nature Chemistry” on April 14. Pyun and Griebel’s co-authors are Woo Jin Chung, Adam G. Simmonds, Hyun Jun Ji, Philip T. Dirlam, Richard S. Glass and Árpád Somogyi of the UA; Eui Tae Kim, Hyunsik Yoon, Jungjin Park, Yung-Eun Sung, and Kookheon Char of Seoul National University in Korea; Jeong Jae Wie, Ngoc A. Nguyen, Brett W. Guralnick and Michael E. Mackay of the University of Delaware in Newark; and Patrick Theato of the University of Hamburg in Germany.